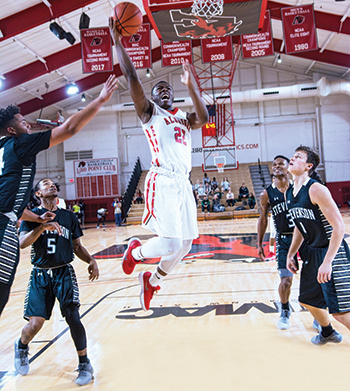 A pair of Albright basketball athletes picked up multiple postseason awards after leading their respective teams to the NCAA Tournament. Senior DeJuan Smith was named MAC Commonwealth men’s basketball player of the year in addition to earning NABC First Team All-District Honors, and D3hoops.com All-Middle Atlantic Region honors. Smith finished the season ranked fifth in the MAC Commonwealth with 16.9 points per game, third with 7.8 rebounds per game, first with 2.1 steals per game and second with nine double-doubles. He led the Lions to a first place finish in the regular season standings and a berth in the MAC Commonwealth Championship game for the second-straight season in addition to the program’s first NCAA Tournament bid since 2010. Senior Alysha Lofton also earned conference player of the year honors as she garnered the MAC Commonwealth women’s basketball accolade. Lofton also became the second player in program history to earn WBCA All-American honors, while also picking up D3hoops.com All-Middle Atlantic Region honors. Lofton helped lead the Lions to their third consecutive NCAA Tournament appearance, and fourth straight MAC Commonwealth Tournament Championship Game appearance. She also found herself in the top 10 in five major statistical categories in the conference as well. Lofton led the conference with 2.7 steals per game, ranked fourth with 14.4 points per game and 1.6 blocks per game in addition to placing fifth with 3.7 assists per game, and seventh with 7.6 rebounds per game. A pair of Albright women’s lacrosse players reached career milestones as the Lions defeated crosstown rival Alvernia 17-1 in MAC Commonwealth Conference play. Junior Sophie Bass scored her 100th career goal, while sophomore Kelly Baumann posted her 100th career point. Bass already achieved a new career high in goals scored with 42 this past season, which is currently tied with Baumann for the team lead. Bass registered eight hat tricks this past season as well, with a new career-high in goals scored in a single game. Baumann recorded her 100th career point in her 30th game as a member of the Albright women’s lacrosse program. She has already bested her goal and assist total from her freshman season as she has compiled 42 goals and 15 assists for a total of 57 points in 2018. Baumann also set a new career goals scored in a single game mark this season when she scored nine against McDaniel in March. The duo currently rank among the leaders in the MAC Commonwealth Conference in points and goals. Men’s basketball head coach and co-athletic director, Rick Ferry, has been appointed to serve as a member of the NCAA Division III Men’s Basketball Committee. This is the second time in Ferry’s 18-year stint with the Lions that he has been elected to serve on the committee. He previously served from 2004 to 2007. As the NCAA Tournament in March approaches, Ferry will have a hand in picking the field for the upcoming 2019 NCAA Division III Men’s Basketball Tournament. The committee administers and conducts full operation of the NCAA Division III Men’s Basketball Tournament which also includes selecting the weekly regional rankings that begin in early February. Ferry is coming off being named MAC Commonwealth Coach of the Year for the third time in his career and leading Albright to its third NCAA Tournament appearance. Senior Albright men’s track & field athlete, Jonathan Bieber, won his third straight gold medal in the 110m hurdles as the Albright Lions track & field teams competed in the MAC Outdoor Track & Field Championships. Bieber concluded his Albright career by taking home his third consecutive gold medal in the 110 meter hurdles with a time of 15.36. He now has won four gold medals at MAC Championships in his four years at Albright. He also finished sixth in the 400-meter hurdles with a time of 56.82. Bieber finished as one of the more decorated track & field athletes in Lions program history with four career gold medals at MAC Championships.